Happy 80th Birthday, Toni Morrison! Dear Toni Morrison. I’m gonna skip the formalities and just call you Aunt Toni, if that’s alright. Please don’t be offended by my familiarity. In my head, that’s who you are. And you’ve been there for me for years, offering sage words that I may not have always understood, even though they’ve resonated in my soul. I remember the first time I read one of your books. It was my freshman year of college – growing up in Trinidad, my exposure to American literature was quite limited until I left the island. It was all Shakespeare, Chaucer, Thomas Hardy and Caribbean authors like V.S Naipaul, Sam Selvon and Olive Senior for me, until I migrated to Miami and was plunged headfirst into the world of American wordsmiths. Your writing lingered with me in a way that not many authors did. The first time I read Song of Solomon, I read it carefully, keeping my eyes open for metaphors and trying to analyze your words rather than enjoy them. That’s the nature of college literature classes, at least in my experience. You read and read and read, but what stays with you afterward? Often I’ll remember an essay I wrote about a book, but not the book itself. But that has never been the case with your books, not for me. Your characters have stayed with me, and spoke to me. In some cases they’ve told me about myself. Or warned me against my dealings with others. Song of Solomon . Sula . The Bluest Eye . Beloved . Your novels lit a torch inside me, to be a published author myself some day. And when I finally had the opportunity to see you speak, I jumped at the chance. Your words were spoken to a standing room only crowd at the University of Miami that day, but they went straight to my heart. I’m working on it, Aunt Toni! I’m finally ready. My first book won’t be fictional, or particularly literary. It’s going to be culled from the topics I explore on my blog, and I’ll be honest, I haven’t figured it all out yet. All I know is that I want it to be meaningful. I want it to be cherished and handed down from mother to daughter. It won’t be Song of Solomon or Beloved, not by a longshot! But because of those books I know the feelings I want my eventual book to evoke. I want to inspire. I want to uplift. Your writing has made me aspire to greatness, and I am so grateful for that. Even though my career path has led me away from the world of fiction and literature, I know that someday I’ll be back. Someday I will write that novel that lies deep within my heart. And when I do, your words will be there to guide and inspire me every step of the way. As you’ve done for so many here, and around the world. Thank you so much for everything you’ve done. I hope your 80th birthday is amazing and full of love and fabulous gifts! This letter was FULL of AWESOME! I find Toni Morrison’s books so hard to read because I also try to understand everything. However, Sula is one if my favorite boks EVER. EVER. EVER. THAT book has stayed with me since I first read it in high school. And I reread it regularly. But yes, Happy birthday, Toni!!!! Afrobella, you have captured my love in your letter so perfectly. I too have SO MUCH love for Aunt Toni, and Luvvie, Sula is my second favorite book ever (after Maya Angelou’s I Know Why the Caged Bird Sings. She is truly an awesome jewel and I’m honored that she has graced us with her amazing gift. WOW – this letter was great!! I love that quote about writing the book you want to read & I looooooooooove ME SOME Toni Morrison. I love Sula, The Bluest Eye, Jazz & all the other ones I’ve read – although I did have a hard time with Song of Solomon. Happy B-day Auntie Toni (I hope that I can call you that too). I had noooooo idea that you were turning 80 – you still look fabulous!!! Thank you for being you and enriching us with your perspective and interpretations! HOLY COW SHE’S 80???? she looks amazing!! Reading Toni Morrison got me through high school and college with my sanity intact. I love Song of Solomon. And Sula’s last words “Wait’ll I tell Nel.” gets me every time. I don’t know if this is a fairly recent picture, but 80 looks wonderful on her. I love Toni Morrison! So Happy Birthday to her! And Afrobella, I posted an article on How to write your own self help book in 12 days on my new site. Check under the label DO IT YOURSELF. It’s an easy recipe! I just published my first one and you can do it too! Good luck! Happy Birthday Toni, wow what an inspriration I hope to look that good at 80. Toni’s words are so powerful that one can only sometimes just feel them until we into them enough to fully understand them, but I think that comes from just living life but her words are like a vault you keep in your mind, you can reference back to them in times of need and know that they r true. I totally share your admiration and I love what you wrote. Even though my career path has led me away from the world of fiction and literature, I know that someday I’ll be back. 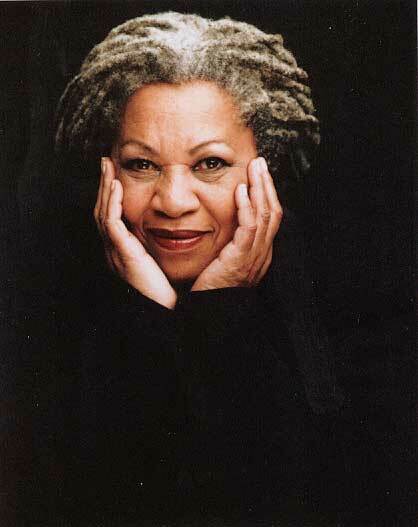 Happy birthday,Toni Morrison.you are looking fabulous even at 80.you have written everything very beautifully.! I love that quote about writing the book you want to read. Dear Toni, I’m ferch speaking. I’ve just discovered you, thru an interview in french tv. I’ll try to makemore knowledge later. SYS. You are geat!